Take a 3.5-hour guided brewery tour to some of Milwaukee's best brew spots. On this tour you will not learn how beer is made, but why it's made. You will meet the founders, the brewers, and some of the long time employees who's passion is great beer. Ask questions, learn their story, and drink local beer. Our small-group tour is limited to 14 people. Visit Lakefront Brewery, Gathering Place Brewing, Black Husky Brewing, and end the tour at Company Brewing. Two 6 ounce beers are included at each brewery. Meet your guide at Company Brewing at 1:15pm. Once known as the 'Brew City,' Milwaukee has not seen the amount of breweries present today since the 1840s! 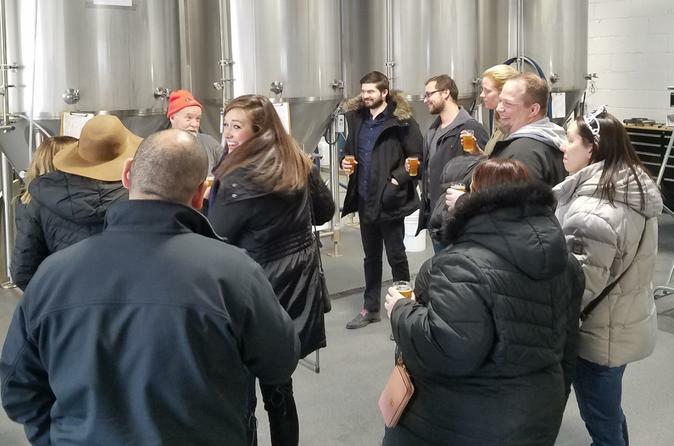 While it might be fun to sample each and every one of them, this tour features four of the best breweries found in Milwaukee's Riverwest neighborhood. Our first stop is Lakefront Brewery, one of the first and most successful Micro-Breweries in Milwaukee! Lakefront began in an old bakery in Riverwest and has since grown to produce almost 50,000 barrels per year. Some of their accomplishments include the first certified organic beer in the country, the first gluten free beer recognized by the US Government, as well as what may be the first bottled fruit beer since prohibition. Next up is Gathering Place Brewing. Opened in August of 2017, Gather Place is the newest brewery in Milwaukee! In an ode to the Native American meaning of our present day Milwaukee, Gathering Place creates a space to join others at the "gathering of the waters" to enjoy their vibrant and unique beers. Meet Joe the owner and find out why he gave up a crazy life in Washington D.C. to return home to Milwaukee. Moving on, we head to Black Husky Brewing. Started in a cabin way "Up North" in Pembine Wisconsin in 2010, Black Husky moved to Riverwest in 2016. Each beer is inspired by the 23 sled dogs in their kennel - including "Sproose 2" the only Spruce IPA brewed year round in the US. The founder Tim hates giving tours but will make an exception just for us! Our last stop is Company Brewing. Keeping things local, Company has created a "neighborhood pale ale" brewed with hops harvested in the backyard of their neighbors! George took his 14 years of experience in the coffee industry and turned it into a thriving brewery with a full kitchen and live music. Tour concludes at Company Brewing.